The state’s already difficult budget situation was made worse this year by a significant drop in revenues due to a sluggish economy. The enacted budget, combined with special session actions in February 2008, contains about $24 billion in solutions and projects a General Fund reserve of $1.7 billion. As described in more detail below, this large gap primarily was closed through numerous one–time revenue solutions and the lack of inflationary adjustments for many state spending programs. Unfortunately, the nation’s worsening economic troubles have already threatened the budget plan’s viability. The state spending plan for 2008–09 includes total budget expenditures of $131.6 billion. This includes $103.4 billion from the General Fund and $28.2 billion from special funds. As Figure 1 shows, total state spending declines slightly by $511 million from 2007–08 (0.4 percent). Bond fund spending is expected to increase by 1.3 percent, as the state continues to allocate funds from the $43 billion bond package approved at the November 2006 election. Figure 2 summarizes the estimated General Fund condition for 2007–08 and 2008–09 under the budget plan. a Display of revenues related to the BSA is different than the administration’s. The 2006-07 revenue amount (reflected in the prior-year fund balance) includes $472 million and the 2007-08 revenue amount includes $1.023 billion in General Fund revenues received in those years and transferred to the BSA. The administration instead shows the entire $1.494 billion as 2007-08 revenues, when the funds were transferred back to the General Fund. The issuance of an additional $3.3 billion in deficit–financing bonds (also known as economy recovery bonds, or ERBs). These bonds are paid back from the “triple flip” financing mechanism and transfers from the Budget Stabilization Account (BSA). The adoption of new penalties on corporations for underpayment of taxes. Most of the new penalties ($1.4 billion) will be accrued to 2007–08. As a result of a change in state accounting practices, the accrual of $0.4 billion in revenues to 2007–08. Despite these revenue changes, the state spent almost $800 million more during 2007–08 than it received. 2008–09. The budget plan projects revenues of $102 billion in 2008–09, a decrease of 0.5 percent from 2007–08. The plan authorizes expenditures of $103.4 billion, an increase of 0.1 percent. Under the plan, the state has a projected reserve of $1.7 billion and will spend $1.4 billion more than it is projected to receive. Figure 3 outlines the major pieces of the state’s $24 billion in solutions adopted in response to its major budget shortfall. a Amount above current law. Borrowing. As noted above, the state sold an additional $3.3 billion in ERBs during the spring of 2008. This sale exhausts the state’s $15 billion in authority provided by the voters through Proposition 57 in 2004. In addition, the budget plan borrows $648 million from various state special funds. These funds are generally not expected to be paid back to special funds until 2010–11 or later. This special fund borrowing is in addition to the $750 million in outstanding special fund loans from prior years. As shown in Figure 4, the state began the year with more than $18 billion in outstanding budgetary borrowing—requiring more than $2 billion in repayments during the budget year. Timing Changes on Tax Payments. The budget package accelerates the timing of two types of tax payments—estimated payments and limited liability company fee payments. Combined, these changes are expected to increase 2008–09 revenues by $2.7 billion. Revenue Accrual. The budget package changes the state’s accounting practices to accrue about $1.9 billion earlier than otherwise would be the case. This is a “paper change” and does not alter the amounts or timing of any tax payments. Corporation Penalties. The budget anticipates $1.5 billion in increased revenues resulting from new penalties on corporations for underpayment of taxes. Net Operating Loss (NOL) Provisions. The budget suspends the use of NOL deductions for two years for larger companies while providing more benefits to businesses in future years. Tax Credit Limitations. The budget plan restricts for larger companies the use of specified business–related tax credits in 2008 and 2009, resulting in an estimated increase of $690 million in 2008–09. a At time of budget enactment. b Reflects settle-up obligation for 2002-03 and 2003-04. Proposition 98. The budget provides a 0.68 percent cost–of–living adjustment (COLA) to K–14 programs—substantially below the 5.66 percent level that otherwise would be required under state law. BSA Transfer. The Governor issued an executive order to suspend the annual transfer to the BSA. Consequently, a $1.5 billion supplemental debt–service payment for outstanding ERBs will not be made this year. Transportation. The budget uses $1.7 billion in transportation funds to reduce General Fund expenditures. This is about $800 million more than would have been used to benefit the General Fund under the 2007–08 budget agreement. State Employee Pay. Most state employees (other than highway patrol officers and engineers) are not budgeted for COLAs this year. The Legislature rejected funding (over a two–year period) for a correctional officer pay increase proposed as part of the administration’s compensation offer. Social Services COLAs. The budget plan suspends scheduled state–supported COLAs for both Supplemental Security Income/State Supplementary Payment (SSI/SSP) and California Work Opportunity and Responsibility to Kids (CalWORKs) recipients. Other Reductions. In other areas, the budget includes many of the budget–balancing reductions (BBRs)—generally 10 percent of program funding—originally proposed as part of the Governor’s January budget. Ballot–Related Measures. The Legislature passed a series of measures to be placed before the state’s voters pertaining to the state lottery and budget practices. It is expected that a special election will be called for the first part of 2009 to vote on these propositions. The lottery proposition would provide the Lottery Commission with increased flexibility to set prize payouts. In addition, the state would be authorized to borrow billions of dollars in future lottery profits to benefit the General Fund in the near term. The budget reform package would increase payments to the BSA, further restrict when funds can be taken out of the BSA, and provide the Governor with enhanced authority to make spending reductions during the fiscal year. General Fund Spending by Program Area. Figure 5 shows General Fund spending by major program for 2006–07 through 2008–09. These amounts do not include other sources of funding, such as state special, local, or federal funds. For instance, K–12 education excludes funding provided by local property taxes. In addition, year–to–year changes in spending are significantly affected by a variety of one–time factors. For example, resources spending as budgeted is expected to drop in the budget year, due to extraordinary firefighting costs in 2007–08. (However, the actual firefighting costs in 2008–09 are uncertain and could be considerably higher than budgeted.) Spending in the “other” category will drop by more than $2 billion. About one–half of this drop is due to the state not making a supplemental debt–service payment on outstanding ERBs through the BSA in 2008–09. Much of the redirection of transportation dollars to benefit the General Fund is also reflected in this category as a negative expenditure. Finally, General Fund spending on social services is growing at 8.1 percent, due primarily to funding shifts and federal requirements in the CalWORKs program. 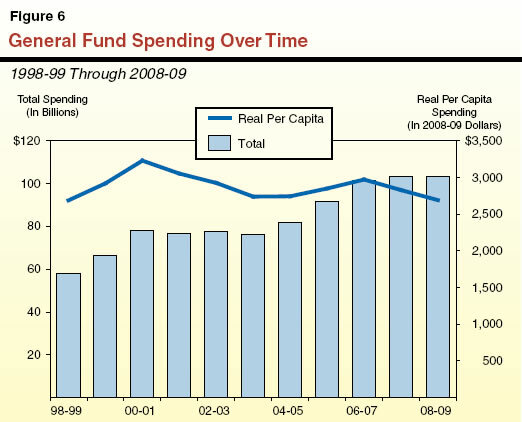 Figure 6 shows General Fund expenditures from 1998–99 through 2008–09 both in current dollars and as adjusted for population and inflation (that is, in real per capita terms). The figure illustrates that after growing rapidly in the late 1990s, real per capita spending fell significantly throughout the first part of the 2000s before rebounding through 2006–07. For 2008–09, real per capita spending is projected to be at the same level as it was in 1998–99. As described above, many of the budget solutions are of a one–time nature. Based on the 2008–09 budget plan’s policies, therefore, the state would once again face multibillion dollar operating shortfalls in the coming years. A key piece of the budget plan is the lottery proposal to ask voters to authorize the borrowing of billions of dollars in future lottery profits. Currently, the plan envisions borrowing $5 billion in each of the next two fiscal years to help balance the budget. The magnitude of additional solutions that will be necessary to balance upcoming budgets will largely depend on the health of the state’s economy and tax revenues. We will be updating our fiscal projections for 2008–09 and future years in November 2008, when we release our annual California’s Fiscal Outlook. In this section, we highlight the major developments in the evolution of the 2008–09 budget, beginning with the Governor’s original January budget proposal and ending in September 2008, when the budget was signed into law. At the time of the 2007–08 budget’s passage, it was expected that the state’s persistent gap between revenues and expenditures would reemerge for 2008–09 in an amount of at least $5 billion. By the time the Governor proposed his 2008–09 budget in January, however, that projected shortfall had grown to $14.5 billion due to continued softness in the state’s economy, delays in several 2007–08 budget solutions, and rising costs in some programs. As a result of the bleak budget outlook, the Governor declared a fiscal emergency under the State Constitution and called the Legislature into special session. Raising $3.3 billion from issuing additional ERBs. Changing the state’s accrual practices to count $2 billion in 2009–10 revenues in 2008–09. Suspending the $1.5 billion 2008–09 BSA transfer. Suspending the Proposition 98 minimum guarantee for 2008–09. Reducing most programs’ spending by 10 percent in an across–the–board manner. These reductions were known as BBRs. The administration also expressed concern about the state’s ability to meet its cash demands. The administration proposed special session legislation to delay the timing of a series of state payments. Specifically, the administration proposed to shift $4.7 billion from July and August 2008 to later months to increase the state’s cash–on–hand prior to the state’s issuance of revenue anticipation notes (the state’s typical external cash flow borrowing within a fiscal year). Budget Reform. The Governor also proposed putting a constitutional amendment before the state’s voters related to the state’s budgeting practices. The measure would have limited the amount of revenues that the General Fund could receive in any year to the average revenue growth rate from the past decade. Any excess revenues were to be put into a new state reserve and could not be accessed unless a year’s revenues were below the ten–year average. In addition, the Governor proposed a system of automatic across–the–board reductions if the state’s budget situation declined after a budget’s passage. In February, the Legislature adopted a package of more than $7 billion in solutions which brought the 2007–08 budget back into balance and began the process of balancing the 2008–09 budget. Figure 8 lists the solutions that were adopted. (Some solutions later were amended by actions taken with the passage of the 2008–09 Budget Act.) More than $6 billion of the adopted solutions were one–time in nature and, therefore, did not address the state’s ongoing shortfall between revenues and expenditures. The Legislature also adopted the administration’s proposed cash management solutions with some modifications, including making the shifts effective for 2008–09 only (rather than ongoing as originally proposed). a The administration excludes this issue from both its problem and solution definition. A further deterioration of the economic and revenue outlook for 2008–09 ($6 billion). Rising state expenditures in a number of state programs ($1.7 billion). In addition, in January, the administration assumed that many of its proposals would be adopted by March 1, 2008. For proposals which had not been adopted by the Legislature, the administration revised its savings estimates in May down by $0.5 billion, assuming implementation by July 1, 2008. The May Revision also reversed several key January proposals. In May, the administration proposed $1.1 billion in higher Proposition 98 spending and $196 million in higher university spending compared to January. In addition, the administration dropped its proposals for the early release of state prisoners and the closure of 48 state parks. These developments also added to the budget problem, but were offset in part by some program savings. New Solutions. As a result of these changes, the administration proposed more than $8 billion in new solutions, which are summarized in Figure 9. By far the largest proposal was the sale of $5 billion in lottery bonds which were to be paid back from future lottery profits. The administration proposed placing the lottery proposal on the November 2008 ballot. If the ballot measure failed, a one cent sales tax increase would have gone into effect. With these proposals, the May Revision had a projected reserve of $2 billion. Included a $10 billion tax revenue package, including imposing 10 percent and 11 percent income tax brackets, raising the corporation tax rate, implementing a tax amnesty program, suspending NOL provisions for companies, suspending personal income tax indexing for inflation, and eliminating the dependent credit for high–income taxpayers. Proposed spending totaling more than $3 billion higher than the May Revision, including $2.2 billion more for Proposition 98 K–14 education (providing a 2.12 percent COLA). Rejected most of the administration’s proposed reductions in health and social services. Provided $600 million in alternative savings in criminal justice, through a package of inmate and parole population reductions and local public safety subvention reductions. Did not include revenue accrual, lottery, or budget reform proposals. Replaced most of the tax revenue provisions included in the Conference version of the budget. It instead included a one cent increase in the sales tax rate for three years, followed by a permanent one–quarter cent reduction. It also included a smaller tax amnesty program, modified the NOL suspension, and included a revenue accrual proposal similar to the January budget. Provided no COLA for Proposition 98 programs. Included a smaller package of prison population reductions. Proposed a lottery securitization proposal that would not yield a General Fund benefit until 2009–10. Proposed a budget reform package that focused on increasing transfers into the BSA, limiting transfers out of the BSA, and increasing executive authority to make midyear reductions. The August Compromise had a reserve of $1.1 billion. On the night of September 15, the Senate and Assembly passed a budget and sent it to the Governor. Key components were rejection of tax rate increases, replaced by a number of one–time revenue increases, and the final budget also included: (1) increased Proposition 98 spending to allow a COLA of 0.68 percent, (2) increased redevelopment pass–through payments to benefit the state by offsetting General Fund support, (3) redirection of transportation funds to benefit the General Fund, and (4) no prison or parolee population changes. The Governor threatened to veto this budget plan. After further negotiations, the Legislature made two key modifications to its budget. First it replaced PIT withholding changes with increased penalties on corporations for underpayment of taxes owed. Second it modified the budget reform proposal to make it more difficult to transfer funds out of the BSA. After making $510 million in General Fund vetoes, the Governor signed this budget package on September 23. The Governor vetoed $191 million in funding for low–income seniors’ tax relief programs, suspending their operation for the budget year. The Governor also vetoed $22 million from the California Department of Corrections and Rehabilitation budget and directed the department to establish a new parole program designed to divert certain parole violators from prison to community sanctions. In addition, the administration stated that it expects $340 million in savings from its July executive order. The stated reserve of the enacted budget was $1.7 billion. Additional details on the enacted budget package are provided throughout this publication. In addition to the 2008–09 Budget Act, the budget package includes a number of related measures enacted to implement and carry out the budget agreement. (A criminal justice bill was not passed by the Legislature as part of the budget.) The Legislature also passed a package of legislation in February 2008 during the budget special session to help bring the 2007–08 budget back into balance. Figure 10 lists these bills. The 2008–09 budget package included a significant number of tax–related changes, although no broad–based tax increases were enacted. These changes contributed $8 billion to the 2008–09 Budget Act. The longer–term impact of these provisions, however, is much smaller. In fact, after 2009–10, the net impacts of these changes are expected to reduce state General Fund revenues below what they would have otherwise been. Figure 1 summarizes the major tax–related changes adopted in the 2008–09 Budget Act. As the figure shows, these revisions result in a combined $8 billion in additional revenues in 2007–08 ($1.9 billion) and 2008–09 ($6.1 billion). In 2009–10, the additional resources generated by these changes falls sharply, bringing in an estimated $1.6 billion. Then, starting in 2010–11, the net impact of these changes is negative, growing from –$117 million to –$427 million in 2011–12 (and greater amounts thereafter). These revenue effects result from a number of major statutory provisions, which we have grouped into three categories: tax expenditure changes, revenue accelerations, and other changes. We discuss these provisions in more detail below. As Figure 1 displays, $1.9 billion in revenues are projected for 2008–09 from reducing or suspending existing tax expenditure programs. Tax expenditure programs are special tax provisions—such as exemptions, deductions, and credits—that attempt to encourage certain types of behavior or target relief to specific groups of people or businesses. The 2008–09 budget package includes changes to two significant tax expenditures: net operating loss (NOL) provisions and business–related credits. Suspends NOL Deductions. The budget agreement eliminates the NOL deduction for firms with taxable business income over $500,000. This change, which applies to tax years 2008 and 2009, is estimated to raise $1.2 billion in 2008–09. Under current law, firms that report a taxable loss in one year can apply the loss as a deduction in a future year in which they turn a profit. The budget package also expands the NOL deduction in two ways. First, it extends the period for which an NOL can be carried forward to 20 years from the current 10 years. Second, the legislation allows firms to “carry back” NOLs for up to two years to retroactively reduce their tax bills from previous years. For example, a firm that turns a profit and initially owes taxes in 2013 but records an NOL in 2014 will be able to file an amended return for 2013 and apply all or part of the 2014 NOL to reduce its 2013 tax bill. The carryback provisions are phased in beginning in 2011. Similar to the expansion of the NOL deduction, the budget package also expands the value of tax credits in future years. Starting in 2009–10, a firm that is part of a unitary group will be allowed to share its unused credits with other firms in the same unitary group. (Generally speaking, unitary groups allow corporations to be taxed similarly no matter whether they are structured as a single entity with divisions or separate, but closely related, corporations.) Currently, credits must be applied against income earned by the same company. This provision is expected to increase the cost of these business credits by more than $300 million annually beginning in 2010–11. The 2008–09 budget package also includes three provisions that accelerate the collection of existing personal and corporate taxes. These changes generate an estimated $2.7 billion in 2008–09. Because these measures do not alter the underlying amount of taxes paid by Californians (only their timing), these changes have a much smaller ongoing effect after 2008–09. Accelerates Estimated Payments. The 2008–09 budget package requires taxpayers to pay a larger proportion of estimated tax payments in the first one–half of the calendar year. Most taxpayers have taxes withheld from their paychecks each pay period. Taxpayers also are required to make estimated payments each quarter when taxes are not withheld (typically, for income such as dividends, capital gains, or self–employed income). The general rule calls for taxpayers to pay 25 percent of their estimated annual liability that is not subject to withholding each quarter (April, June, September, and December). Under the budget agreement, however, starting in 2009, payments in April and June will increase to 30 percent of the annual liability. The September and December payments would fall to 20 percent. By shifting the timing of estimated payments, this provision is estimated to generate an additional $1.4 billion in 2008–09. Eliminates the “Safe Harbor” Provision for Estimated Payments. A second change in the budget package results in an increase in the amount of estimated payments high–income individuals are required to make. Under current law, taxpayers face penalties if estimated payments fall below 90 percent of the current year’s liability. One exception to this rule—called the safe harbor rule—waives these penalties if the taxpayer’s estimated payments equal at least 100 percent of the previous year’s liability. The budget package deletes this safe harbor provision beginning in 2009 for taxpayers with incomes over $500,000 ($1 million for married couples filing joint returns). The budget assumes an additional $1 billion in revenues in 2008–09 due to this timing change. Accelerates Payments From Limited Liability Companies (LLCs). The third revenue acceleration in the budget package requires LLCs to pay a fee to the state earlier than previously. Current law directs LLCs to pay an income–based fee to the state each year by April 15 (for most companies)—four months after the end of the tax year. The new provision requires most companies to make this payment 11 months earlier—by June 15th, or roughly halfway through the current tax year. This ongoing timing change is estimated to bring in $360 million in 2008–09 and about $50 million annually thereafter. Alters Accrual Accounting Rules. The budget package redefines the way estimated tax payments are treated in the state accounting rules. Generally, the state operates under an “accrual” accounting system, which requires the state to recognize revenues and expenditures during the fiscal year in which they are realized. To implement this principle, prior law directed state agencies to recognize revenues in a fiscal year if the funds were collected within two months after the close of the fiscal year and if the underlying transaction took place in that fiscal year. The budget agreement deletes the two–month limit. Under the new rule, for example, a tax payment due in January 2010 can be “booked” in fiscal year 2008–09 if the underlying transaction that generated the taxable income took place in fiscal year 2008–09. The budget assumes this change will increase revenues in 2007–08 by $416 million and in 2008–09 by $1.4 billion. Increases Penalty for Underpaying Corporate Income Taxes. The budget package establishes new penalties for significantly underpaying corporate income taxes. Currently, a corporation may be penalized when it fails to pay its full tax liability as required by law. Beginning in 2009, the state will impose a 20 percent penalty for all cases in which underpayment exceeds $1 million. A firm can avoid the new penalty for tax years 2003 through 2007 if it files an amended return by May 31, 2009. The 2008–09 budget assumes this provision will result in an additional $1.4 billion in revenues based on the assumption that many firms will take advantage of the penalty amnesty. Because most payments are expected to result from prior–year tax liabilities, the revenues are assigned to the prior fiscal year—2007–08. Tribal Payments to General Fund Projected to Increase. The Legislature has ratified compacts in recent years that allow several tribes to expand their casino operations. Most of these compacts have increased tribes’ required payments to the General Fund. The budget package relies on an administration estimate that tribal payments to the General Fund will increase from $143 million in 2007–08 to about $485 million in 2008–09. This figure for 2008–09 includes $38 million from the new Red Hawk Casino in El Dorado County, which is owned by the Shingle Springs Band of Miwok Indians. Chapter 334, Statutes of 2008 (AB 3072, Price), ratifies an amended compact that expands the number of slot machines the tribe is allowed to operate. This amended compact with the Shingle Springs tribe now awaits approval by the U.S. Department of the Interior. Grants to Non–Casino Tribes Continue to Be Funded From Distribution Fund. Several of the recent compacts ratified by the Legislature eliminated some tribes’ payments to the Indian Gaming Special Distribution Fund (SDF). (The SDF is an account that funds casino regulatory activities, the state’s problem gambling programs, grants to local governments affected by casino development, and budget shortfalls in another account—the Indian Gaming Revenue Sharing Trust Fund [RSTF]. The RSTF provides $1.1 million in annual grants to dozens of tribes that have no casino or only a small casino.) The Governor’s January budget proposal assumed that the General Fund—rather than the SDF—would cover the approximately $40 million of costs to cover the RSTF’s expected budget shortfall in 2008–09. The May Revision, however, proposed instead that funds from the SDF be appropriated to cover the costs of the RSTF’s budget shortfall—thereby saving $40 million of General Fund resources. The Legislature adopted the May Revision proposal with minor modifications. Casino Mitigation Grants to Local Governments Will Resume. In 2007, the Governor vetoed a $30 million appropriation from the SDF for grants to local governments affected by casino development. The Governor cited a Bureau of State Audits (BSA) report that was critical of several aspects of the existing grant distribution methodology. In response, the Legislature enacted Chapter 754, Statutes of 2008 (AB 158, Torrico), which includes provisions to address several of the BSA’s findings. Chapter 754 also appropriates $30 million from the SDF for local government grants in 2008–09 and extends the statutory sunset date on the methodology for distributing the grants from January 1, 2009, to January 1, 2010. The Board of Equalization (BOE) and the Franchise Tax Board (FTB) are among the few state departments for which the budget authorizes major expansions of funding. Each of the two departments will add about 250 new positions over the next two years for enhanced efforts to reduce the difference between owed and remitted taxes—known as the “tax gap.” The budget act assumes $205 million of additional General Fund revenues in 2008–09 as a result of these tax gap enforcement efforts at a cost of $28 million. Both costs and revenues are expected to increase in subsequent years. Under the spending plan, BOE is directed to use the additional resources to improve its filing of tax liens in bankruptcy liquidations, improve use tax collections from California service businesses, and augment sales and use tax audit and collections programs activities. Enhanced tax gap enforcement activities at FTB include increased fraud detection and prevention activities, pursuit of additional audit and collections workloads, review of inactive collections accounts where new asset information is available, mandatory electronic payment of personal income tax payments above a specified dollar threshold, and increased analysis of federal audit findings for unpaid state liability. Proposition 98 funding constitutes about three–fourths of funding for education (which includes child care, preschool, K–12 schools, and community colleges). In this section, we review major Proposition 98 decisions for 2007–08 and 2008–09 and then identify outstanding Proposition 98 funding obligations. In the following sections, we discuss the K–12 and child care budgets in more detail, and in the “Higher Education” section, we discuss the community college budget in more detail. Below, we recap Proposition 98 spending adjustments made during the special session, explain the effect of revenue changes on the Proposition 98 funding requirement for 2007–08 and 2008–09, and highlight the major Proposition 98 spending decisions for 2008–09. Final Revenue Package Affects Proposition 98 Minimum Guarantee for 2007–08. As of February 2008, the adjustments made during the Third Extraordinary Session left Proposition 98 spending for 2007–08 more than $1 billion above the Proposition 98 funding requirement. However, the final budget package includes components that increase the revenue attributed to 2007–08, thereby raising the Proposition 98 funding requirement such that it roughly matches the special session spending level ($56.6 billion). Specifically, the final budget package scores $1.9 billion in additional revenue to 2007–08 ($0.4 billion related to tax accrual and $1.4 billion related to increased penalties on corporation tax underpayments). These higher revenue assumptions raise the Proposition 98 minimum guarantee for 2007–08 by about $950 million (assuming no other changes). Most New Proposition 98 Spending Goes to Backfill Ongoing Programs. Not reflected in the figure, however, are several significant spending decisions that affected Proposition 98–funded programs in 2007–08. These include roughly $1 billion in one–time funds supporting ongoing K–14 programs in 2007–08 and about $200 million in one–time reductions made during the Third Extraordinary Session. Because most of the $1.5 billion in new 2008–09 Proposition 98 spending is used to backfill these 2007–08 “holes,” the actual amount of Proposition 98 resources available to support new activities in 2008–09 is only about $300 million, or 0.5 percent. This is discussed in more detail below, as well as in the subsequent “K–12 Education” and “Community College” sections of this report. Increase Designated for Small Cost–of–Living Adjustment (COLA), Growth Adjustments. After backfilling for programs funded with one–time funds in the prior year, the budget package designates most of the new funding in 2008–09 for a small COLA. As shown in Figure 2, general purpose funding for school districts, county offices of education (COEs), and community colleges would receive a 0.68 percent COLA. This is notably less than the statutory K–12 COLA rate of 5.66 percent. The budget does not include any COLA for K–12 or community college categorical programs. (As discussed below, the final budget package includes a “deficit factor” for the foregone COLA for school districts and COE revenue limits, although not for K–14 categorical programs or community college apportionments.) Also shown in Figure 2, the final budget package makes various growth–related adjustments, including funding anticipated growth in both California Work Opportunity and Responsibility to Kids (CalWORKs) and non–CalWORKs child care ($22 million) and community college enrollment ($114 million). These costs are offset by estimated savings of $128 million from an expected decline in K–12 attendance. a Reflects caseload adjustments for Stages 2 and 3. The state currently faces a number of other Proposition 98–related funding obligations. Several of these obligations, highlighted in Figure 3, can be funded from within annual Proposition 98 appropriations. These include “deferrals,” unpaid mandate claims, and the revenue limit deficit factor. The 2008–09 budget package substantially increases these obligations. Two additional commitments—one related to a K–14 program established in 2006–07 and the other to “settling–up” unmet prior–year Proposition 98 obligations—require additional General Fund resources outside of the annual Proposition 98 appropriation. The budget package funds the new program but does not provide any settle–up funding. a Reflects cumulative obligations at year end. b Based on a 2004 court ruling and the cost of pending claims relating to the state's high school science graduation requirement, we estimate the state could owe an additional $160 million for fiscal years 2003-04 through 2008-09. Moreover, if the Commission on State Mandates approves the proposed Reasonable Reimbursement Methodology for teacher salary costs extending back to 1995, then the amount owed would be significantly larger. Outstanding Obligations Grow to More Than $4 Billion. Figure 3 displays outstanding Proposition 98–funded obligations through the end of 2008–09. The figure shows these commitments were reduced by more than $1 billion in 2006–07, with the substantial repayment of K–12 mandate claims and full restoration of K–12 revenue limits. In contrast, the 2008–09 budget package substantially increases outstanding obligations—making no progress toward paying down outstanding deferral and mandate obligations, providing no funding for new K–12 mandate costs, and little funding ($4 million) for community college mandate costs. It also creates a sizeable new K–12 revenue limit obligation. As a result of these factors, outstanding obligations will grow to more than $4 billion in 2008–09. The specific obligations are discussed in more detail below. Deferrals. From 2001–02 through 2003–04, the state achieved substantial budget solution by delaying certain Proposition 98 spending. Specifically, the state decided to defer significant education costs ($1.3 billion) to the subsequent fiscal year. Rather than a budget reduction, these deferrals resulted in districts receiving some state funds a few weeks later than normal (commonly called the “June deferral”). The state has not yet shifted this payment back to its regular schedule. Mandates. Since 2001–02, the state has delayed reimbursing schools and community colleges for mandate claims. In essence, the state has required schools and colleges to undertake certain activities but has not paid them for the costs they have incurred. We estimate the annual costs of funding existing mandated activities is around $190 million (roughly $160 million for K–12 education and $30 million for community colleges). While the state made a large payment for outstanding mandate claims in 2006–07—eliminating debts from several prior years—it has been providing virtually no funding for ongoing mandate costs. As a result, the balance of outstanding mandate claims continues to grow. Revenue Limits. To achieve budget solution in 2003–04, the state made reductions to K–12 revenues limits. Rather than making these reductions permanent, the Legislature decided to create an obligation to add the foregone amount—referred to as the deficit factor—to the revenue limit base in future years. As shown in the figure, this obligation was fully met in 2006–07, thereby raising revenue limits to the level they would have been absent the earlier reduction. However, as discussed earlier, the 2008–09 budget package provides only a partial COLA for K–12 school district and COE revenue limits—0.68 percent rather than the statutory rate of 5.66 percent. Consistent with previous practice, the budget package establishes a new deficit factor for the foregone COLA, creating a statutory commitment to use Proposition 98 funds at some point in the future to raise revenue limits to the level they would have been absent the 2008–09 reduction. As shown in the figure, the foregone revenue limit COLA totals almost $1.8 billion in 2008–09—$1.75 billion for school districts (resulting in a deficit factor of 4.71 percent) and $30 million for COEs (resulting in a deficit factor of 4.40 percent). Substantial Increase for Quality Education Investment Act (QEIA). In addition to the $58.1 billion in Proposition 98 funding discussed above, the final budget package includes $450 million in General Fund monies to support the second year of the QEIA program. Of this amount, $402 million is provided to K–12 schools and $48 million is provided to California Community Colleges (CCC). This represents a substantial increase from the 2007–08 funding levels ($268 million was provided to K–12 schools and $32 million to CCC). As set forth in Chapter 751, Statutes of 2006 (SB 1133, Torlakson), the state has scheduled $450 million annual payments until a total of $2.8 billion has been provided (estimated to occur in 2013–14). No “Settle–Up” Payment Provided. In 2002–03 and 2003–04, the Proposition 98 constitutional funding requirement ended up being higher than the amount of Proposition 98 funding appropriated. As a result, the state incurred a settle–up obligation totaling $1.1 billion across the two years. In Chapter 216, Statutes of 2004 (SB 1108, Committee on Budget and Fiscal Review), the state decided to pay off this obligation in $150 million annual installments until the entire $1.1 billion had been paid. Of the annual $150 million payments, $125 million is designated for K–12 education and $25 million is designated for CCC. The final budget package notwithstands the Chapter 216 requirement and does not provide the scheduled 2008–09 payment. In this section we summarize the 2008–09 budget package for K–12 education and describe the Governor’s K–12 vetoes. K–12 Funding From All Sources Remains Relatively Flat Year to Year. Figure 4 displays all significant funding sources for K–12 education in 2007–08 and 2008–09. The figure shows that funding from all sources remains relatively flat year to year, with total funding in 2008–09 ($71.9 billion) increasing only $281 million, or 0.4 percent, compared to 2007–08. b Total for 2007‑08 includes one-time California State Teachers’ Retirement System payment required by court order. Large Amount of One–Time Funds Backfilled With Ongoing Funds. Also shown in the figure, ongoing K–12 Proposition 98 spending in 2008–09 increases to $51.6 billion, which is about $1.3 billion more than the spending level for 2007–08. However, this increase is offset by a $1 billion year–to–year decrease in spending from all other fund sources. This decrease is mostly explained by the large amount of one–time funding included in the 2007–08 budget (reflected in the “other programs” and “other funds” categories). The TTIGs, Deferred Maintenance, High–Priority School Grants, Home–to–School Transportation, and Charter School Facility Block Grants were all at least partially supported with one–time monies in 2007–08. In the 2008–09 budget package, these one–time funds are backfilled with ongoing Proposition 98 dollars. (This represents the first time charter school facilities have been funded with ongoing rather than one–time funds.) As a result, funding from various sources has changed across the two years, but K–12 schools will receive about the same amount of total programmatic funding, with the slight increase in 2008–09 going to support the small COLA for revenue limits ($244 million). The budget recognizes $191 million in federal funding available for schools and districts in Program Improvement (PI) under the federal No Child Left Behind (NCLB) Act. Under NCLB, schools and districts that fail to meet federal performance targets for two consecutive years enter PI. After two additional consecutive years of not meeting federal performance targets, PI schools and districts enter corrective action and are subject to federal sanctions. The new budget plan for 2008–09 integrates available federal funding to support PI districts facing corrective action. New Program Funds Districts Facing Corrective Action. In this initial year of the program, a district facing corrective action may apply for a one–year, nonrenewable grant to assist in its improvement efforts. Districts must use the funds in accordance with NCLB requirements. Pursuant to the technical assistance requirements under NCLB, the State Board of Education (SBE) may require a district to use improvement funds to contract with a technical assistance provider. If required to use such a provider, funding must first be used to cover the associated cost. Funding Linked With Severity of Performance Problems. Under the new plan, eligible districts are to be placed in one of three funding categories based on the severity of their performance problems, as determined by SBE. Funding is then allocated based on the number of PI schools in the district, with school rates ranging from $50,000 to $150,000 depending on the funding category. For 2008–09, 149 districts with roughly 1,400 PI schools are expected to receive funding. A total of $111 million is expected to be expended in 2008–09, leaving $80 million to carry over to the subsequent year. Per Pupil Funding Increases Less Than 1 Percent. As shown in Figure 5, total per pupil funding increases by $111, or just less than 1 percent, from 2007–08 to 2008–09. Based on the 2008–09 Budget Act, ongoing Proposition 98 per pupil spending is $8,726—an increase of $262, or 3.1 percent, over the prior year. However, including all the one–time monies supporting ongoing, traditionally Proposition 98–funded programs in 2007–08, the year–to–year increase in per pupil Proposition 98 funding is $112, or 1.3 percent. One–Time Funds Used for Emergency Facilities. In addition to ongoing Proposition 98 spending, the budget package includes slightly more than $100 million in one–time K–12 spending. Specifically, it provides $101 million for emergency facility needs at low–performing schools. This meets the annual requirement for Chapter 899, Statutes of 2004 (SB 6, Alpert), which implements the Williams v. California settlement. Chapter 899 requires the state to provide a total of $800 million for this program over a number of years. Since 2005, the state has provided $393 million (including the new 2008–09 funds). To date, $246 million has been allocated to schools. Budget Uses Other Funds to Avert Reductions to Existing Programs. The budget package also includes the use of federal and special funds to help offset reductions in General Fund spending. The adopted budget restores a proposed $9.2 million unallocated reduction to the State Special Schools (SSS) using $8.9 million in federal special education funds and $300,000 from the state Public Transportation Account (PTA). (The budget uses an additional $3.8 million in PTA monies to help the SSS cover increases in its base transportation costs.) The budget also uses an additional $5.4 million in federal Title II monies to fund University of California (UC) Subject Matter Projects ($5 million), teacher misassignment monitoring ($308,000), and administrator training ($100,000). In all three cases, the federal funds are used to avert reductions proposed by the Governor. The Governor vetoed $8.7 million from various fund sources for the following K–12 expenditures. State Monitoring of Low–Performing Schools ($6 Million). The Governor eliminated $6 million (ongoing Proposition 98 funding) to support state sanctions for low–performing schools that previously participated in the Immediate Intervention for Underperforming Schools Program (II/USP). Schools that participated in II/USP face state monitoring and sanctions for failing to meet performance criteria needed to exit the program successfully. Although II/USP ended in 2004–05, approximately 50 schools have yet to meet performance criteria to exit state monitoring. As a result, they continue to receive funding to implement state–imposed sanctions. The veto is consistent with prior legislative action to eliminate federal funding for the phased–out program. Advancement Via Individual Determination ($904,000). The Governor reduced funding for this program by $904,000 (non–Proposition 98 funding). In his veto statement, the Governor stated the reduction was made to achieve state savings, not due to any programmatic issues. Child Nutrition ($862,000). The Governor reduced state funding for child nutrition programs by $862,000 (non–Proposition 98 funding). This reduction also was made to achieve state savings rather than as a result of programmatic concerns. Migrant Education ($600,000). The Governor reduced expenditure authority by $600,000 (federal funding) as a result of rejecting a proposed enhancement to an existing evaluation of the federal Migrant Education Program. As a result of the veto, the federal funding likely will roll forward to next year. Reviews of Districts With Emergency Loans ($295,000). The Governor deleted $295,000 (one–time Proposition 98 funds) for conducting reviews of the three school districts that currently receive emergency loans from the state, stating that the districts should be responsible for funding these reviews. In this section, we summarize the 2008–09 budget package for child care and development (CCD) programs and describe the Governor’s CCD vetoes. Budget Contains More Than $3 Billion for CCD Programs. The final budget package includes just over $3.2 billion for CCD programs in 2008–09. Of that total, $2.6 billion (approximately $2.1 billion in state spending and more than $500 million in federal support) is for CCD programs administered by the California Department of Education. Consistent with previous years, a notable portion of the ongoing CCD program is supported in 2008–09 with one–time funding ($338 million in one–time state funds and $7 million in one–time federal funds). CCD Funding Increases More Than 5 Percent Year to Year. As shown in Figure 6, total funding has been increased by more than 5 percent. The majority of the year–to–year change is due to CalWORKs caseload adjustments. By comparison, funding for non–CalWORKs programs is flat year to year when comparing the budget act funding levels for 2007–08 and 2008–09. (The reduction in non–CalWORKs funding shown for the 2007–08 revised budget reflects various one–time adjustments.) For non–CalWORKs direct child care programs, the budget provides no COLA and a growth adjustment of only $11 million (0.7 percent). The final package includes no major programmatic changes. a Except where noted otherwise, all programs are administered by the California Department of Education. b California Work Opportunity and Responsibility to Kids. c Administered by California Department of Social Services. d Does not include reserve funding in 2007-08. No reserve was created in 2008-09—base funding was increased instead, as shown here. e Includes funding for centers run by California Community Colleges. Addressing Child Care Carryover Issues—Exploring Changes to Contract Policies. For each of the past five fiscal years, at least $200 million of the CCD appropriation has gone unspent and has been “carried over” to fund future years of service. The result of such chronic carryover is that less children are served than intended and more children remain on the waiting list for subsidized CCD services. Approximately 22,000 more children could be served each year if all appropriated funds were spent. To address this issue, the 2008–09 budget makes changes intended to facilitate voluntary contract changes between providers—allowing providers to relinquish funding they will not use to other providers who are serving additional children and can use the funds. Although these contractual changes are unlikely to fully address the CCD carryover, they represent a positive step in that direction. The Governor deleted a $16.4 million legislative augmentation (one–time Proposition 98 funds) for Stage 2 CalWORKs childcare programs, citing lower caseload estimates. The Governor also vetoed a bill that would have enacted changes to the After School Education and Safety (ASES) program. Assembly Bill 1526 (Committee on Budget), which was part of the budget package enacted by the Legislature, would have removed the requirement that a minimum amount of state funding be provided annually for the ASES program. The Governor vetoed the bill. If it had been signed and subsequently approved by voters, ASES funding would have become subject to the annual budget process, beginning in 2009–10. The budget provides a total of $11.4 billion in General Fund support for higher education in 2008–09 (see Figure 7). This reflects an increase of $149 million, or 1.3 percent, above the amount provided in 2007–08. As shown in the figure, this net increase is almost entirely due to a $164 million augmentation for CCC. The General Fund budgets of the other higher education agencies and segments remain nearly flat on a year–to–year basis. General Fund Support. As shown in Figure 7, the enacted budget provides the UC with $3.3 billion in General Fund support, and the California State University (CSU) with $3 billion in General Fund support. The budget includes language (proposed by the Governor) which characterizes UC and CSU’s budgets as including unallocated reductions of $201 million and $172 million, respectively. These amounts represent the difference between what the budget provides and what the segments had expected to receive under the “compact” they signed with the Governor in 2004. The budget also reflects allocated reductions (from the level expected under the compact) to executive administrative costs of $32.3 million at UC and $43.2 million at CSU. Student Fees. For 2008–09, the UC and CSU have enacted fee increases of 7.4 percent and 10 percent, respectively. The enacted budget assumes these fee increases will provide additional revenue of $125 million for UC and $110 million for CSU. Because fee revenue is unrestricted, the fee increases effectively provide base augmentations to the segments’ budgets. When both General Fund support and fee revenue are combined, UC’s base funding increases by 3.2 percent and CSU’s base funding increases by 3.4 percent. Compensation Increases. In a departure from recent practice, the enacted budget does not assume any particular amount of funding will be used for compensation and other cost increases. Moreover, the Governor vetoed a provision, added by the Legislature, directing UC to redirect $15 million from administrator compensation to salary increases for low–wage workers. Supplemental report language requires both segments to report by January 10, 2009, on any compensation increases they provide in 2008–09, including how such increases are being funded. Labor Institutes. The Governor vetoed $5.4 million in General Fund support for UC’s labor institutes. The Legislature had adopted budget language earmarking funding for this purpose. The budget provides $6.4 billion in ongoing Proposition 98 funding for CCC in 2008–09, which is 10.9 percent of total Proposition 98 appropriations. This is $240 million, or 3.9 percent, more than the revised 2007–08 level. However, this year–to–year increase falls to about 2.7 percent when factoring in additional funding that was provided on a one–time basis for 2007–08 to address a shortfall in CCC local property taxes. Enrollment and Base Budget Increases. Under the budget agreement, the CCC system receives an augmentation of $114 million to fund new enrollment growth of 2 percent, or about 23,000 FTE students. (The community colleges are funded to serve a total of about 1.2 million FTE students in 2008–09.) The budget also includes $40 million to fund a 0.68 percent base increase for CCC. The enrollment and base budget increases apply only to CCC apportionments (general–purpose monies), and not to categorical programs. Student Fees. The budget package makes no change to student fee levels, which remain at $20 per unit. These fees are expected to generate over $290 million in revenue for the CCC system. 2007–08 Local Property Tax Backfill. The budget includes a total of $74.9 million to compensate for a shortfall in CCC’s local property tax revenues in 2007–08. This backfill is derived from three sources (the first two of which involve Proposition 98 funds): (1) a $47.3 million reappropriation of unspent CCC enrollment funds from 2006–07, (2) a $21.6 million reappropriation of unspent 2007–08 funds from K–12’s ASES program, and (3) $5.9 million in surplus 2007–08 student fee revenue. Chancellor’s Office. The Legislature provided the Chancellor’s Office with $10.1 million in General Fund (non–Proposition 98) support for 2008–09. However, the Governor vetoed $331,000 of this amount, thereby reducing Chancellor’s Office funding to $9.8 million. As a result, the Chancellor’s Office will experience a slight decline (about $160,000) in funding compared to 2007–08 levels. The budget provides $838 million in General Fund support for CSAC, which is $5.4 million less than the 2007–08 amount. The Legislature rejected the Governor’s January proposal to phase out the competitive Cal Grant program and restored the associated $57 million reduction. The enacted budget fully funds projected Cal Grant awards in both the competitive and entitlement programs. The Legislature also restored authorization for the commission to award a total of 8,000 awards under the Assumption Program of Loans for Education (APLE), which the Governor had proposed to reduce to 7,200. However, the Governor vetoed funding for these additional warrants, and thus the enacted budget provides for 7,200 new APLE awards in 2008–09. The budget package includes trailer legislation related to the sale of EdFund, a nonprofit auxiliary that administers federal student loan guarantee programs on behalf of CSAC. The 2007–08 budget package had authorized the Department of Finance (DOF) to sell EdFund or complete an alternative transaction (such as a lease), and assumed that this would generate $1 billion for the state in 2007–08. The 2008–09 budget package (1) assumes the state will receive $500 million, rather than $1 billion, from the EdFund transaction, (2) assumes such revenue will not be received until 2009–10, and (3) extends DOF’s authority to sell or otherwise dispose of EdFund until January 10, 2011. A new federal grant provides $7.4 million in support for financial aid awareness programs previously funded from other sources. The budget designates these grant funds to maintain the California Student Opportunity and Access Program at the 2007–08 level, provide an additional $1 million for outreach to promote career technical education, and support the Cash for College program at a reduced level of $330,000, about $158,000 less than the prior year. Shifted $24 million in Cal Grant costs to the Student Loan Operating Fund (SLOF). Approved the Governor’s May Revision proposal to replace General Fund support for loan program oversight with $1 million from the SLOF. However, the Governor vetoed one–half of this backfill, thus reducing total funding for these oversight activities. Approved one–half of the Governor's proposed $1.6 million unallocated General Fund reduction. In the enacted budget, the Governor expanded this unallocated reduction to $1.5 million. The enacted budget provides the three segments with $976 million to support a variety of capital outlay projects. It reflects several changes that the Legislature made to the Governor’s proposal for higher education capital outlay. The Governor proposed to fund most capital outlay projects with revenue from a new general obligation bond he proposed to place before the voters in November 2008. The Legislature rejected the general obligation bond proposal and deleted many of the proposed projects. However, the Legislature funded a number of priority projects in two ways. First, it redirected unused funds from previous bond acts—which the Governor’s proposal would have used for new projects—to finish projects that had already been approved in previous budgets and are currently underway. Second, the Legislature appropriated $428 million in lease–revenue bond proceeds to fund high–priority, mainly new, projects at UC and CSU. As a result, the enacted budget initiates new projects that can be completed with available funding. In contrast, the Governor’s proposal would have begun some new projects whose completion would depend on the future passage of a ballot measure. The 2008–09 spending plan provides almost $21 billion from the General Fund for health programs. This is an increase of about $610 million, or 3 percent, compared to the revised prior–year spending level, as shown in Figure 8. Several key aspects of the budget package are discussed below and summarized in Figure 9. Note: Detail may not total due to rounding. The 2008–09 spending plan provides about $14.4 billion from the General Fund ($38.6 billion all funds) for Medi–Cal local assistance expenditures. This amounts to about a $290 million, or 2.1 percent, increase in General Fund support for Medi–Cal local assistance compared to the revised prior–year spending level. This increase would have been greater if not for the inclusion in the spending plan of various reductions. We discuss the most significant of these reductions below. Existing Program Costs and Caseload Drive Net Increase. The net increase in expenditures primarily reflects ongoing growth in existing program costs and caseloads. Specifically, the budget assumes that the Medi–Cal Program will grow by about 59,000 enrollees, or almost 1 percent, to a total of about 6.7 million average monthly enrollees in 2008–09. Medi–Cal Provider Rate Reductions. The Legislature and Governor took some significant actions regarding provider rates during a February 2008 special legislative session held to address certain budget issues. Legislation enacted at that time, Chapter 3, Statutes of 2008 (ABX3 5, Committee on Budget), reduced most Medi–Cal provider reimbursement rates by 10 percent as of July 1, 2008. These reductions did not apply to certain providers including contracted inpatient hospital services, most skilled nursing facilities, and Intermediate Care Facilities for the Developmentally Disabled. Some Medi–Cal provider groups challenged the legality of these rate reductions in court, and on August 18, 2008, a federal judge issued an injunction blocking enforcement of the reductions for certain types of services provided on or after that date. The Department of Health Care Services has appealed the court ruling, but the court case had not been resolved at the time this report was prepared. Physicians and Most Other Providers—Reduced by about 1 percent. Pharmacy and Long–Term Care—Reduced by 5 percent (for long–term care, the reduction applies to those not subject to paying quality assurance fees). Hospitals—For hospitals that provide Medi–Cal services but do not contract with the state, rates will be reduced by the greater of 10 percent or an amount determined by average regional Medi–Cal contract rates. Managed Care Plans—The monthly premiums that Medi–Cal pays to managed care plans will be reduced to correspond to the rate reductions described above. These reductions will vary by individual managed care plan. Thus, the budget plan includes savings of $291 million General Fund to reflect the combined net effect of (1) the special legislative session reductions, (2) the administration’s assumptions regarding the court order, and (3) the partial restorations in 2008–09 described above. The resolution of the court proceedings may affect the level of savings achieved by the rate reductions. Unspecified Reduction. The budget plan includes an unspecified reduction in Medi–Cal local assistance of $323 million General Fund. This adjustment is intended to account for historical trends showing that actual Medi–Cal expenditures have fallen short of budgeted levels in several recent years. The Governor vetoed a comparable amount for a similar adjustment in the 2007–08 Budget Act. County Administration Funding. The budget plan reduces funding to the counties for administration of the Medi–Cal Program by $53 million, or 7 percent. The budget achieves these savings by first suspending the 2008–09 COLA for savings of $32 million General Fund and then making an additional reduction of $21 million. The budget plan also suspends financial penalties for counties that do not meet eligibility processing performance standards while the COLA remains suspended. Medi–Cal Eligibility Reporting Requirements. The budget plan includes $14 million in General Fund savings from changes in Medi–Cal eligibility rules. Specifically, the budget plan eliminates continuous eligibility for children. (Under continuous eligibility, children are only required to certify their Medi–Cal eligibility one time per year.) Families would now be required to report twice each year as to whether their children are still eligible for Medi–Cal as a condition of maintaining their benefits, consistent with current requirements for adults. The department expects the semiannual reporting requirement, which sunsets on January 1, 2012, to decrease caseload by about 34,000 average monthly enrollees in the budget year. Payment of Medicare Part B Premiums for Unmet Share–of–Cost Beneficiaries. Under the Medi–Cal Program, certain beneficiaries are required each month to pay a certain amount of their own medical expenses, which is known as their share of cost. Medi–Cal pays for costs in excess of this share of cost. Some of these Medi–Cal beneficiaries are also enrolled in Medicare Part B outpatient health care benefits. The budget plan includes savings of $48 million General Fund from eliminating state payment of Medicare Part B premiums for many beneficiaries who have not met their monthly share of cost. Medi–Cal will continue to pay the premiums for beneficiaries whose monthly share of cost is $500 or less. Governor’s Veto of California Discount Prescription Drug Program. Chapter 619, Statutes of 2006 (AB 2911, Núñez), created a prescription drug program that would have allowed lower–income Californians to purchase prescription drugs at lower rates. The Governor vetoed $7.9 million General Fund budgeted to implement Chapter 619. In total, the spending plan provides about $349 million from the General Fund ($2.7 billion all funds) for DPH. This reflects a decrease of about $46 million General Fund ($126 million all funds), or 12 percent, compared to the revised prior–year spending level. The Governor’s January budget proposed about 70 separate budget–balancing reductions (BBRs) to achieve a total of about $32 million in General Fund savings in DPH programs. Generally, these BBRs proposed 10 percent cuts to state administration and programs administered by DPH. The Legislature adopted $43 million in General Fund reductions in various public health programs. The Legislature adopted about $26 million of the Governor’s BBRs. In addition to the adopted BBRs, the Legislature made further reductions totaling about $13 million General Fund by decreasing funding for several programs and eliminating funding for community–based preventative health screenings for adults. The Legislature delayed by one year the implementation of Chapter 526, Statutes of 2006 (SB 739, Speier) for the tracking and prevention of infections acquired while receiving care in hospitals. The Legislature also delayed by one year a project to upgrade the Viral and Rickettsial Disease Laboratory in Richmond. By taking these two actions the Legislature achieved about $4 million in General Fund savings. The Governor further reduced public health spending by $16 million. He did so by vetoing $5 million General Fund consistent with BBRs that were rejected by the Legislature. Beyond these BBR–related vetoes, the Governor also vetoed an additional $11 million General Fund from DPH’s budget. These additional vetoes partly reversed a legislative restoration of funding for HIV/AIDS programs and eliminated support for the following four programs: (1) the TeenSMART Outreach Program, (2) the Male Involvement Program, (3) the Beach Safety Program, and (4) the State Public Health Subvention. The spending plan provides about $398 million from the General Fund ($1.1 billion all funds) in local assistance for HFP. This is slightly above the revised prior–year General Fund spending level. The budget assumes that program caseload will grow by about 6 percent during 2008–09. The budget reflects three cost–cutting measures to achieve about $30 million in savings that roughly offsets the costs of caseload growth. These budget actions (1) reduce the rates paid by the state to the managed care plans that provide services to HFP enrollees by 5 percent, (2) impose an annual dental coverage limit of $1,500, and (3) increase premiums for HFP subscribers with incomes above 150 percent of the federal poverty level (currently about $21,200 for a family of four). Generally, the fee increase ranged from $2 to $4 per month, per child, depending on family income. The spending plan provides about $2.1 billion from the General Fund ($3.7 billion all funds) for DMH. This is an increase of about $95 million from the General Fund, or 4.8 percent, compared to the revised prior–year level of spending. The budget increase is mostly due to (1) increases in funding for “AB 3632” programs (originally established in 1984 state legislation) to provide mental health services for special education students as well as (2) caseload and utilization increases in long–term care services programs. State Hospitals/Long–Term Care Services. The spending plan provides about $1.2 billion from the General Fund for state hospital operations and long–term care services, a $49 million increase in General Fund resources over the revised prior–year spending level. Spending growth includes General Fund increases of about $2.6 million for the Conditional Release Program, $6.7 million for activation of 64 additional mental health beds at Salinas Valley State Prison that are operated by DMH, and approximately $8 million to support the continued activation of Coalinga State Hospital. The spending plan achieves $9.8 million in savings through the elimination of state subsidies to the counties for state hospital beds occupied by county mental health plan enrollees. The spending plan also achieves $3.8 million in savings from the closure of the Metropolitan State Hospital program for seriously emotionally disturbed youth. Community Programs. The 2008–09 budget includes about $835 million from the General Fund for local assistance for the mentally ill, an increase of about $66 million in General Fund support compared to the revised prior–year level of spending. Mental Health Managed Care. The budget provides about $225 million General Fund for support of the Mental Health Managed Care Program, a decrease from the revised prior–year spending level of almost $13 million General Fund, or 5.5 percent. The decrease reflects the Governor’s veto of $7.7 million from the program as well as legislative approval of a proposal by the Governor in January to eliminate $5.4 million to implement federal regulations on informational materials for Medi–Cal beneficiaries. AB 3632 Programs. The spending plan includes $104 million General Fund in the DMH budget to pay for mental health services provided to children enrolled in special education as directed under the AB 3632 programs. This increase of $52 million above 2007–08 spending levels reflects the budgeting of a full 12 months of payments. Early and Periodic Screening, Diagnosis, and Treatment (EPSDT). The spending plan provides about $467 million General Fund for support of EPSDT, an increase from the prior–year adjusted spending level of about $20 million, or nearly 4.5 percent. This growth is due to a number of factors including increases in caseload, cost, and utilization. The spending plan also supports a statewide project to streamline and coordinate care for the highest–cost EPSDT users to achieve an estimated $12 million in General Fund savings. In addition to the budget actions described above, the February special session resulted in two actions to reduce EPSDT program costs by $14 million on an ongoing basis. These actions include the elimination of a COLA and reductions related to administrative efficiencies. The budget provides $2.8 billion from the General Fund ($3 billion all funds) for services for individuals with developmental disabilities who are clients of developmental centers (DCs) and regional centers (RCs). This amounts to an increase of about $240 million, or 9.3 percent, in General Fund support over the revised prior–year spending level. Community Programs. The spending plan includes a total of $2.4 billion from the General Fund for community services for the developmentally disabled, an increase in General Fund resources of about $285 million over the revised prior–year level of spending. The growth in community programs is due mainly to increases in caseload, costs, and utilization of RC services. As part of the special session, several cost control actions related to RC purchase of services that had been renewed annually for the past few years were adopted on a permanent basis. This action will result in estimated savings of $241 million General Fund in 2008–09. The budget plan also assumes estimated savings of about $7.5 million General Fund by reducing Supported Employment Program provider rates by 10 percent based upon a July 1, 2008 implementation date. (A corresponding reduction of about $700,000 General Fund was made in the Department of Rehabilitation budget.) The budget plan saves another $7.5 million General Fund by modifying the review process for RC clients’ individual program plans. The budget also extends various RC operations cost–containment measures adopted in previous budget plans to achieve savings of more than $20 million General Fund in 2008–09. Developmental Centers. The spending plan includes a total of about $362 million from the General Fund for the DCs, a decrease in General Fund resources of about $48 million compared to the prior–year spending level. The DC budget for operating expenses and equipment was reduced by almost $6 million General Fund. Almost $12 million in General Fund savings are to be achieved by delaying startup, and thereby reducing staffing costs, for the recently completed 96–bed expansion of the secure treatment unit at Porterville DC. Similarly, the budget delays renovation of 24 kitchens at Porterville, for a General Fund savings of about $18 million. Agnews Closure. The budget reappropriates about $22 million from the prior year for costs related to the closure of Agnews DC in Santa Clara County. Agnews was scheduled to close on June 30, 2008. However, setbacks in developing suitable community placements for Agnews clients resulted in a delay of the closure. The reappropriation of funds will facilitate the placement of the remaining Agnews’ clients into the community in 2008–09 and the closure of the facility. The budget provides about $300 million from the General Fund ($591 million all funds) for the Department of Alcohol and Drug Programs (DADP). This is an increase of about $10 million in General Fund spending, or 3.5 percent, for alcohol and drug programs. The budget adds about $14 million to account for caseload and utilization growth in the Drug Medi–Cal Program and $25 million for drug treatment services for parolees supervised by the California Department of Corrections and Rehabilitation (CDCR). Partly offsetting these funding increases is nearly $28 million in General Fund reductions resulting from Governor’s vetoes, which are discussed below. Governor’s Vetoes. Consistent with the BBRs proposed in January, the Governor vetoed about $15 million General Fund from drug offender treatment programs. Specifically, the Governor vetoed: (1) about $10 million in funding for the Substance Abuse and Crime Prevention Act (also known as Proposition 36), (2) about $2 million from the Substance Abuse Offender Treatment Program, and (3) about $3 million from the drug court program. In addition, the Governor vetoed $8 million that had been budgeted for the California Methamphetamine Initiative (CMI), an advertising campaign to prevent methamphetamine use by Californians. This veto went beyond the $1 million reduction in the program the Governor had originally proposed in January and effectively eliminates all of the funding for the third year of the three–year CMI. General Fund support in the 2008–09 budget for social services programs totals $10.4 billion, an increase of $784 million (8.1 percent) since the prior year. Most of this increase is in the CalWORKs program and is due to the depletion of the state’s reserve of federal Temporary Assistance for Needy Families (TANF) funds. Past expenditures of these federal funds means that more CalWORKs program costs must be supported from the General Fund beginning in 2008–09. Also contributing to increased CalWORKs costs are an increase in the TANF maintenance–of–effort requirement, and a caseload increase. These cost increases are partially offset by reduced support for county administration and programs for the aged. Figure 10 shows the change in General Fund spending in each major social services program or department. The adopted budget rejects Governor’s proposals to (1) establish sanctions and time limits on aid for CalWORKs children, (2) reduce state participation in wages paid to In–Home Supportive Services (IHSS) workers, (3) not pass through the federal Supplemental Security Income/State Supplementary Program (SSI/SSP) COLA in January 2009, and (4) reduce spending on child welfare services (CWS) and Foster Care. The 2008–09 Budget Act and related legislation make various changes to current law. The most significant fiscal changes as discussed further below are the deletions of the statutory SSI/SSP and CalWORKs COLAs and reductions to CalWORKs welfare–to–work services. Major reductions are summarized in Figure 11. WIA = Workforce Investment Act. June 2008 COLA. The special session budget agreement delayed the June 2008 state statutory COLA for SSI/SSP recipients from June to October 2008. The final budget instead deletes the October 2008 COLA, resulting in total General Fund savings of about $264 million in 2008–09. June 2009 COLA. Additionally, the budget deletes the June 2009 state statutory COLA for SSI/SSP recipients. We estimate that this results in a one–month savings of about $12 million in 2008–09. The administration had estimated that this proposal would save $37 million in 2008–09. However, our estimate is based on more recent estimates of the federal inflation measure. Combined Savings. Taken together, the deletion of these state COLAs results in General Fund savings of about $276 million in 2008–09, increasing to $396 million in 2009–10. Pass–Through of Federal COLA. The Legislature rejected the Governor’s proposal to not pass through the federal COLA available in January 2009. As seen in Figure 12, due to the federal COLA, we estimate that maximum monthly SSI/SSP grants will increase from $870 to $907 for individuals and from $1,524 to $1,579 for couples. Deletion of the July 2008 COLA. Special session budget legislation delayed the statutory COLA for CalWORKs grants from July 2008 to October 2008, resulting in General Fund savings of about $41 million. The final budget plan instead deletes the COLA for additional savings of about $122 million, for a total savings of about $162 million to the General Fund. In high–cost counties, the maximum monthly grant for a family of three remains at $723. Reductions to County Funding. Counties receive a single allocation block grant to cover costs for administration, welfare–to–work services, and child care. Prior law also allowed counties to earn $40 million in incentive funds in 2008–09 by meeting four specified performance goals related to the participation of recipients. The Legislature approved the Governor’s proposals that (1) reduce the county single allocation by about $21 million (counties can make up this loss with balances available from a fraud prevention program) and (2) delay implementation of the $40 million incentive program. The Legislature redirected $10 million of the savings from delaying this incentive program into an expansion of welfare–to–work services for CalWORKs recipients seeking employment and/or training. The Governor subsequently vetoed this $10 million redirection as well as an additional $60 million for CalWORKs welfare–to–work services. Child Care Reimbursement Rates. Budget legislation delays implementation of new reimbursement rates for child care services until March 2009, resulting in savings of about $19 million. Work Incentive Nutritional Supplement (WINS). Budget legislation requires the Department of Social Services (DSS) to develop a WINS program. The WINS program would provide $40 per month in additional food benefits to working poor families. Specifically, the benefits would go to Food Stamps families who are working sufficient hours to meet federal work participation requirements, but are currently not receiving CalWORKs assistance. This program is intended to increase the state’s work participation rate by about 10 percentage points, helping the state meet the federal work participation requirements and possibly avoiding federal penalties in the future. The Legislature added $2 million in the budget to begin the automation changes to implement WINS, but the Governor vetoed this funding. Current Child Support Pass–Through Maintained. When child support is collected from an absent parent on behalf of a child in a family receiving CalWORKs grants, federal law lets states decide whether to pass the money through to the custodial parent of the child. California has been passing through the first $50 per month of such collections to welfare families and retaining the balance of the collections as General Fund revenue to offset its CalWORKs costs. The Governor’s budget plan had proposed to increase the monthly child support pass–through from $50 to $100 beginning in January 2009. This proposal was in response to a 2005 federal law change under which the federal government began to participate in the cost of the child support pass–through. However, the Legislature rejected the Governor’s budget proposal and maintained the pass–through at $50 per month. This means the General Fund will benefit from the new federal financial participation by retaining (rather than passing through) additional federal funding. Specifically, General Fund revenue will increase by $5.6 million in 2008–09, rising to about $11 million in 2009–10. Child Support Enforcement. In developing its automated child support system, the state made a change that placed some non–custodial parents, through no fault of their own, behind in their child support payments, creating an “arrearage” (child support debt). In 2006–07, budget legislation allowed the state to make one child support payment on behalf of each of the affected parents, thus preventing the arrearage and holding these parents harmless. Originally, the cost of these payments in 2006–07 was estimated to be about $26 million. However, the actual cost was about $11 million. The 2008–09 budget reverts the balance of about $15 million to the General Fund. State Operations. The budget adopts various BBRs originally outlined as part of the Governor’s January budget plan which reduce state operations for the department by $4.1 million (8.9 percent) General Fund. One–Fourth of General Fund Support Eliminated. In January, the Governor proposed BBRs totaling about $6.3 million General Fund for the California Department of Aging (CDA). The Legislature approved about $2.3 million of those reductions. The Governor subsequently vetoed $4 million General Fund in order to achieve all of the savings proposed from his original set of BBRs for the department. Additionally, the Governor vetoed another $9.1 million General Fund from various CDA programs that went beyond his original proposal. Thus, the enacted budget reduces General Fund support for CDA by about $15 million (25 percent). The list of affected programs includes the Long–Term Care Ombudsman and supportive services ($6.1 million), the Senior Employment Program ($4.7 million), and the Multipurpose Senior Services Program ($2.5 million). The amounts listed for the vetoes in the Ombudsman and Senior Employment programs exceed the amount of local assistance funding that was actually budgeted. As a result, other aging programs are subject to as much as $1.9 million in additional reductions unless other adjustments are made. 10 Percent Reduction to Adult Protective Services. The Governor originally proposed a BBR of $6.1 million General Fund for the Adult Protective Services (APS) program which helps protect the elderly from abuse. The Legislature rejected this reduction. In the final budget, the Governor vetoed $6.1 million in APS funding to achieve the original level of savings. Reduced Level of Support for Administration of Food Stamps and In–Home Care. In January, the Governor proposed BBRs for county administration of Food Stamps (about $14 million) and IHSS ($7.8 million). The final budget agreement saved $8.6 million and $5.3 million, respectively. Delays and Modifications of Certain Recently Enacted Legislation. The budget plan achieves $2.3 million in General Fund savings by delaying and modifying the implementation of several recently enacted laws. This includes measures (1) providing adopted persons greater opportunities to initiate contact with siblings, (2) allowing federal financial participation to care for certain foster children placed in for–profit facilities, and (3) conforming various state adoption and child welfare laws to recently enacted federal legislation. Foster Care Placements in Out–of–State, For–Profit Facilities. Under current law, state funding is available for seriously emotionally disturbed children placed in not–for–profit residential facilities. Effective January 1, 2009, and until January 1, 2011, AB 1805 (Committee on Budget) would have allowed payments for such children placed out–of–state in a for–profit residential facility. However, the Governor vetoed this legislation. Naturalization Services Program. In January, the Governor proposed a $300,000 (10 percent) BBR for the Naturalization Services Program (NSP), which provides grants to community–based organizations that assist legal noncitizens in attaining citizenship. The Legislature approved this reduction. The Governor then vetoed an additional $2.7 million General Fund, eliminating funding for NSP, for a total of $3 million in savings. Reduction in Case Services and Operating Expenses. The budget makes 10 percent reductions to headquarters administration and the vocational rehabilitation program. The budget also eliminates the purchase of nonfederally mandated services and reduces support for independent living centers. Together, these reductions result in estimated savings of $2 million General Fund. Redirect Workforce Investment Act (WIA) Funds to Offset General Fund Costs. The budget redirects a total of $9.5 million of WIA discretionary funds to offset General Fund costs for parolee employment services operated by CDCR. This results in increased savings of $5.6 million within CDCR. State Operations Reductions. The budget adopted various BBR proposals pertaining to state operations within the departments comprising the Labor and Workforce Development Agency. The reductions total about $1.5 million and mostly involve the elimination of vacant positions. New Workers’ Compensation Assessment. Currently, employers must pay four assessments (annual surcharges) that are added to their workers’ compensation premiums. The estimated $19 million in annual revenue generated from these assessments flows into four separate special funds which are used to support various components of the workers’ compensation program. Effective in 2009, budget legislation creates a fifth fund and increases assessments on employers (by about $2 million) to support workplace safety and health activities. This additional funding, in combination with related changes, will be used to strengthen the condition of various workers’ compensation special funds. The 2008–09 budget contains $13.2 billion from the General Fund for judicial and criminal justice programs, including support of ongoing programs and capital outlay projects. This is an increase of $34 million, or less than 1 percent, above the revised level of General Fund expenditures for 2007–08. Figure 13 shows the changes in General Fund expenditures in some of the major judicial and criminal justice budgets. Below, we highlight the major changes in these budgets. a Includes debt service on general obligation bonds, Office of Inspector General, the State Public Defender, Small and Rural Sheriffs Grants, and other programs. The budget includes almost $3.8 billion for support of the judicial branch. This amount includes $2.2 billion from the General Fund and $698 million transferred from the counties to the state, with most of the remaining balance of about $872 million derived from fine, penalty, and court fee revenues. The budget provides $258 million less than the estimated General Fund workload budget for 2008–09. In comparison to estimated 2007–08 expenditures, the budget plan results in a net General Fund reduction of $30 million (just over 1 percent). Court Operations. Funding for trial court operations is the single largest component of the judicial branch budget, accounting for about 84 percent of total judicial branch spending. The budget includes General Fund savings in trial court operations in the budget year from such actions as using reserve funds to support the trial courts ($92 million) and delaying 110 new superior court judgeships ($71 million). However, such savings are offset to some extent by increased spending. For example, the budget provides $70 million for growth in trial court operations funding, which is based on the California Consumer Price Index rather than on the annual change in the State Appropriations Limit as would otherwise have been required by current law. The budget contains about $10.3 billion from the General Fund for support of CDCR, an increase of $160 million, or 1.6 percent, above the revised 2007–08 level. The Legislature considered a number of budget proposals to reduce inmate and parole populations. 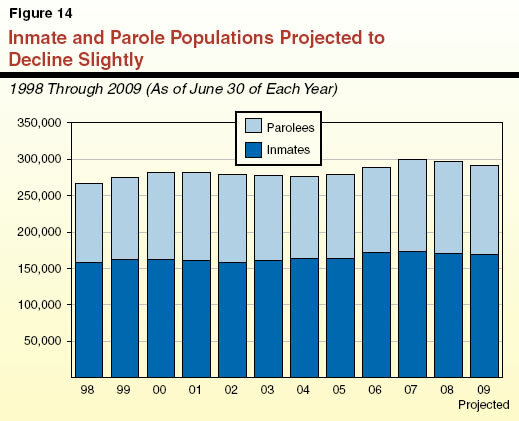 As part of the Governor’s original January budget proposal, the administration proposed two policies—20–month early release from prison for certain inmates and summary parole supervision—that were intended to reduce the state’s inmate and parolee caseloads and reduce operational costs in CDCR by $354 million in the budget year. The May Revision withdrew the early release proposal, but retained the summary parole proposal. The budget conference committee rejected summary parole and instead proposed $445 million in savings from various population reforms (such as earned discharge from parole for certain offenders). The Governor’s August Revision proposed a modified version of the conference committee reforms totaling $175 million in savings. In adopting a final budget, the Legislature approved $14 million of the proposed savings, which was intended to result from modifying the credits that inmates can earn to reduce their time in prison. However, the Legislature did not approve trailer bill legislation to implement such changes in inmate credits so that these savings could be achieved. In signing the budget, the Governor directed CDCR to establish a parole decision–making instrument designed to divert certain parole violators from prison to community sanctions, which could include day reporting centers and community service. Since this would result in savings by reducing the average daily prison population by about 1,100 inmates in 2008–09, the Governor also reduced the department’s budget by $22 million. The use of the decision–making instrument could result in state savings exceeding $100 million at full implementation, currently projected to be in 2010–11. Adult Correctional Health Services. The 2008–09 budget plan funds new and continuing initiatives to carry out the remedial plans of the federal Receiver overseeing inmate medical care. This includes $200 million for additional staff for medical guarding and transportation and $54 million for pharmaceutical purchases and the establishment of a new central–fill pharmacy. Additional support funding is also provided to comply with settlements in the Armstrong inmate disabilities legal case ($14 million) and the Perez inmate dental legal case ($3 million). In adopting the budget package, the Legislature did not approve the Receiver’s $8 billion prison health care construction program and a $135 million supplemental appropriation to address 2007–08 deficiencies in adult correctional health services. At the time this report was prepared, the Receiver’s request was still pending. Corrections Capital Outlay. The budget includes $58 million General Fund and $198 million in lease–revenue bond authority for various capital outlay projects, including an additional $136 million for the San Quentin Condemned Inmate Housing Complex. In adopting the budget, the Legislature did not approve trailer bill legislation regarding the implementation of the prison construction package authorized under Chapter 7, Statutes of 2007 (AB 900, Solorio). The budget provides $446 million in General Fund support for the major public safety local assistance programs. This represents a reduction of $92 million, or 17 percent, below the 2007–08 funding level. Figure 15 shows the changes in local public safety programs. As shown in the figure, the budget includes 10 percent reductions to the Juvenile Probation and Camps Funding program, the Citizens’ Option for Public Safety program, the Juvenile Justice Crime Prevention Act program, and local detention facility subventions (booking fees). The budget also eliminates all funding for the Mentally Ill Offender Crime Reduction program. Funding for the Small and Rural Sheriffs Grant program is maintained at the 2007–08 level. The budget includes $368 million from the General Fund for support of the Department of Justice (DOJ), a reduction of $32 million, or 8 percent, from the revised 2007–08 level. This is primarily due to the elimination of vacant positions ($12 million) and General Fund support for Proposition 69 DNA programs ($11 million). The budget also reverts $17 million in unspent administrative support funding from 2007–08 to the General Fund. In addition, the budget transfers $11 million from the False Claim Act Fund to the General Fund, as well as $69 million in revenue from an energy litigation settlement, to achieve General Fund savings. Finally, the budget transfers $50 million on a one–time basis from the Victim Compensation and Government Claims Board’s Restitution Fund to the General Fund. The 2008–09 budget provides about $7.7 billion from various fund sources for natural resources and environmental programs administered by the Resources and California Environmental Protection Agencies, respectively. This is a decrease of $2.1 billion, or 22 percent, when compared to 2007–08 expenditures. Most of this decrease reflects lower bond expenditures for the budget year, although the budget still includes a major infusion (around $2 billion) of available bond funds from various resources–related measures. These budgets also include a combined $1.9 billion from the General Fund. Figures 16 and 17 compare expenditure totals for resources and environmental protection programs in 2007–08 and 2008–09. As the figures show, General Fund expenditures are lower in 2008–09, reflecting a combination of BBRs and the elimination of a number of one–time expenditures for water and flood–related capital projects that occurred in 2007–08. Lower special fund expenditures for resources programs (state operations) largely reflect a reduction in renewable energy incentive payments, due to a recent statutory change that shifts the funding of these incentives “off budget” to the electricity rate–making process. The significant decrease in local assistance for resources and environmental protection programs is largely due to decreases in bond–funded grant programs. Similarly, the significant decrease in capital outlay for resources programs is due to reduced bond expenditures for this purpose. Bond Expenditure Summary. The budget includes about $2 billion from a number of bond funds (mainly Propositions 50, 84, 1B, and 1E) for various resources and environmental protection programs. Selected highlights of these bond expenditures are shown in Figure 18. Flood Management. The budget includes about $858 million (not including reimbursements) for flood management (mainly bond funds) for statewide planning, levee repairs and improvements, and flood corridor improvements. Of this amount, about $807 million is from Propositions 1E and 84 bond funds, mainly for local assistance and capital outlay, with the balance of $51 million from the General Fund for state operations. Encompassed in the bond expenditure total is about $415 million for the Governor’s FloodSAFE initiative. The initiative is a multiyear, mostly bond–funded, proposal to (1) reduce flood risk throughout the state, including outside the state system of flood control in the Central Valley, (2) develop sustainable flood management systems statewide, and (3) reduce risk during flood events. The breakdown of the bond expenditures (Propositions 1E and 84) for flood management is shown in Figure 19. Canal Lining. The Department of Water Resources budget includes about $14 million from Proposition 84 bond funds (integrated regional water management provisions) for the lining of the All–American and Coachella Canals in Riverside and Imperial Counties to reduce the amount of water that is lost due to seepage. This is a funding shift from what has previously been a General Fund appropriation for these purposes. These projects are related to what is known as the “Quantification Settlement Agreement” that, when complete, will save approximately 100,000 acre–feet of water annually. Integrated Regional Water Management/Stormwater Flood Management. The budget includes about $22 million in bond funds for integrated regional water management, of which about $14 million is allocated to a specific canal–lining project (discussed above) and $8 million is for California Bay–Delta Authority (CALFED) scientific research grants. The budget defers (1) $342 million in Proposition 84 bond funds for integrated regional water management and (2) $102 million in Proposition 1E bond funds for stormwater flood management proposed by the Governor to separate legislation. Following the enactment of the budget act, Chapter 1, Statutes of 2008 (SBX2 1, Perata), was enacted, which includes appropriations of about $182 million (Proposition 84) for integrated regional water management and $150 million (Proposition 1E) for urban stormwater flood protection. CALFED Bay–Delta Program. The CALFED Bay–Delta Program is a consortium of 24 state and federal agencies created to address a number of interrelated water problems in the state’s Bay–Delta region. The budget provides a total of $305 million in state funds for the CALFED Bay–Delta Program in 2008–09, including about $89 million of reappropriations. Of this total amount, the largest program expenditures are for levee system integrity ($66 million) and ecosystem restoration ($50 million). Propositions 50 and 84 bond funds are the largest single sources of funding, providing $105 million and $76 million, respectively. Alternative Delta Conveyance Studies. The budget approves eight limited–term positions (approximately $1.4 million from State Water Project funds) for conducting studies on options for conservation and restoration of the Delta, including alternative means of water conveyance, consistent with the recommendations of the Delta Blue Ribbon Task Force. Climate Change. The budget includes about $45 million (mostly special funds) across nine state agencies for implementation of the Global Warming Solutions Act of 2006 (Chapter 488, Statutes of 2006 [AB 32, Núñez]), to reduce the state’s emission of greenhouse gases (GHGs) to 1990 levels by 2020. Figure 20 lists the expenditures, number of positions, funding sources, and activities funded on an agency–by–agency basis for the implementation of AB 32 in 2008–09. These activities include the development of the Low Carbon Fuel Standard and other measures to reduce GHGs from specific emission sources, and the award of urban forestry grants. Develop Low Carbon Fuel Standard (LCFS) measures, LCFS market-based program, vehicular/industrial measures, and fee structure to support AB 32 implementation. Develop California Environmental Quality Act guidelines for mitigation of GHG emissions, per Chapter 185, Statutes of 2007 (SB 97, Dutton). Adopt GHG emissions mitigation guidelines, per SB 97.
a Supported by a loan from the Beverage Container Recycling Fund, to be repaid within three years. AB 118–Funded Programs. The budget includes (1) $75 million for Energy Commission–administered financial incentives to advance alternative and renewable fuel vehicle technologies and (2) $49 million for the Air Resources Board (ARB) to provide grants and loans to owners of heavy–duty diesel vehicles to retrofit vehicles to achieve early compliance with regulations requiring reductions in emissions of air pollutants and GHGs from these vehicles. These expenditures are funded from fee revenues (smog abatement, vehicle registration, and vessel registration fees) raised pursuant to Chapter 750, Statutes of 2007 (AB 118, Núñez). Air Quality: Emission Reduction Grants. In addition to the $49 million of AB 118–funded financial incentives administered by ARB as discussed above, the budget includes $340 million in special funds and bond funds for grants to reduce air emissions. Of that figure, $90 million is ongoing funding from the Air Pollution Control Fund (supported by smog check–related fees and tire recycling fees) for the Carl Moyer Program, which seeks to reduce emissions of oxides of nitrogen from diesel–fueled engines. The remaining $250 million (bond funds) is for projects that reduce goods movement–related emissions along California’s trade corridors. Hydrogen Highway. The budget includes $6 million from the Motor Vehicle Account (MVA) for financial incentives for zero emission and near–zero emission vehicles and related infrastructure, including grants to establish hydrogen–fueling stations in and between urban regions in implementation of the Governor’s Hydrogen Highway Initiative. Wildland Fire Protection Capital Outlay. The budget includes about $160 million (mostly lease–revenue bonds) for fire protection capital outlay projects—primarily to restore or replace existing facilities. Emergency Wildland Fire. The budget includes $69 million from the General Fund that is designated specifically for emergency fire suppression. As has been the case in previous years, the budget act allows the Director of Finance to augment this amount to pay for additional fire protection expenses, as needed. To date, the state has spent about $272 million in the current year for this purpose, well in excess of the funding specifically provided for these purposes in the budget plan. State Parks. The Governor’s January budget proposed to close 48 state parks and beaches, for a General Fund savings of about $13 million. The enacted budget includes a General Fund spending reduction of $1.5 million with an equivalent increase in park fees. Under the enacted budget, no parks or beaches would be closed. The budget also includes $20 million in bond and special funds for capital outlay projects and $12 million in bond funds for deferred maintenance projects. San Joaquin River Restoration. The budget provides about $16 million (bond funds) for the restoration of the San Joaquin River to implement a lawsuit settlement between the federal government, water users, and environmental groups. Energy Research and Renewable Energy Incentives. The budget includes $75 million for energy–related research and development funded through the Public Interest Energy Research Program and about $67 million for production–based incentives and purchaser rebates to promote renewable energy under the Renewable Energy Program. These amounts are in addition to the $75 million in AB 118–funded financial incentives to advance alternative and renewable fuel vehicle technologies discussed above. The 2008–09 budget plan includes total expenditures of $13.7 billion from various fund sources for the Department of Transportation (Caltrans). This level of expenditures is lower than the expenditure level in 2007–08—by about $365 million (or 2.6 percent). The lower level reflects a reduction in funding from the state’s excise tax on gasoline for highway rehabilitation and a reduction in funding available for transit capital projects. The 2008–09 budget provides approximately $6.2 billion for transportation capital outlay, $2.7 billion for local assistance, $1.8 billion for capital outlay support, and about $1.4 billion for highway operations and maintenance. The budget also provides $397 million for Caltrans’ mass transportation and rail program and $890 million for transportation planning and department administration. The balance of funding goes for program development, legal services, and other purposes. $573 million for the State Transportation Improvement Program (STIP) to fund state and local transportation projects. $573 million to cities and counties for local streets and roads projects. $286 million to the Public Transportation Account (PTA) for mass transportation purposes. Repayment of Past Proposition 42 Suspensions. Proposition 1A, passed by voters in November 2006, requires that Proposition 42 suspensions that occurred in 2003–04 and 2004–05 be repaid with interest no later than June 30, 2016. The budget includes $83 million from “spillover” revenue to partially repay the outstanding amount. (Spillover is the amount that gasoline sales tax revenue at the 4.75 percent rate exceed the sales tax revenue amount generated from all other goods at the 0.25 percent rate.) Following this year’s payment, a balance of $587 million in Proposition 42 loans (not including interest) remains outstanding. Continued Appropriations of Proposition 1B Bond Funds. Proposition 1B authorized the issuance of $20 billion in general obligation bonds for state and local transportation improvements. All Proposition 1B funds are subject to appropriation by the Legislature. The 2008–09 budget appropriates a total of about $4.7 billion for various programs. Figure 21 shows the amount the budget provides to the individual programs. The funding will mainly be used for capital outlay and local assistance purposes. The Legislature also adopted trailer legislation, Chapter 756, Statutes of 2008 (AB 268, Committee on Budget), that further defines and directs the implementation of the State and Local Partnership Program, the Trade Corridor Improvement Fund program, and the Local Transit Capital program funded by Proposition 1B. The budget also loans up to $60 million to the PTA from the Traffic Congestion Relief Fund to keep the PTA solvent in 2008–09. The loan would be repaid by July 1, 2011. This loan is necessary for the PTA to continue to fund transit programs, such as intercity rail and high–speed rail, and to provide $731 million for General Fund relief (as discussed below). Substantial Public Transportation Funds Used to Help General Fund. The PTA derives its revenues from diesel sales tax and portions of the gasoline sales tax, including spillover. The account also receives a portion of the Proposition 42 gasoline sales tax revenue. Funds in the PTA are required statutorily to be used for mass transportation and planning purposes. Since 2003–04, a portion of the spillover revenue has been used each year to benefit the General Fund. In 2007–08, the Mass Transportation Fund (MTF) was created to receive a portion of spillover revenues to benefit the General Fund on an ongoing basis. The 2008–09 budget uses about $1.7 billion in mass transportation revenues to benefit the General Fund. This amount includes $940 million from spillover gasoline sales tax revenues to MTF and $731 million from PTA. Specifically, the General Fund will be helped in the following ways. Transportation Bond Debt Service. The budget uses $856 million in spillover revenues from the MTF to pay for debt service on transportation bonds, including $378 million for costs incurred in 2008–09 and $478 million to reimburse the General Fund for similar costs incurred in prior years. Home–to–School Transportation. The budget provides $593 million in PTA funds to cover a portion of the cost of home–to–school transportation in 2008–09. This amount includes $4.1 million for state special school transportation. Partial Repayment of Proposition 42 Loan. As noted above, the budget provides $83 million in spillover revenues from the MTF to repay a portion of the outstanding Proposition 42 loan in 2008–09. State Transit Assistance. The 2008–09 budget provides $306 million from the PTA for the State Transit Assistance program. This level of funding is the same as 2007–08 and reflects the Governor’s veto of $100 million. This program provides funds to assist local rail and bus transit operators in their operations. No Funding for New Local Transportation Capital Projects. The 2008–09 budget appropriates $50 million from the PTA to reimburse local transportation agencies for STIP transit capital projects. No funding is provided to start new transit capital projects that are scheduled in the 2008 STIP. Increase in Funding for Contract Services Contingent Upon Voter Approval. The budget for the California High–Speed Rail Authority provides about $43 million from various sources to fund administrative costs and contract services such as preliminary engineering and environmental studies. About $14 million was spent for this program in 2006–07 with $21 million expended in 2007–08. However, much of the funding for contract services (about $29 million) is contingent upon the passage of Proposition 1A in November to help finance the rail line. Additional funding would come from the PTA ($5.6 million for administrative costs) and Proposition 116 ($8.2 million for contract services). The 2008–09 budget provides $1.8 billion to fund CHP operations, about $19 million (or 1 percent) more than in 2007–08. This slight increase is the net effect of budget augmentations that are almost entirely offset with budget reductions. The major augmentations include third–year costs to upgrade and replace CHP’s radio communications system ($18.5 million), and increases for inflationary growth on operating expenses and equipment, as well as administrative services provided to CHP by other agencies ($27 million). The budget reductions reflect anticipated savings associated with unfilled officer positions, as well as reductions for one–time costs in 2007–08 that do not continue into 2008–09. For DMV, the budget provides $944 million for departmental operations, a reduction of $63 million (or 6 percent) compared to the 2007–08 level. This reduction mainly reflects the elimination of one–time expenditures made in 2007–08 for capital outlay projects. Most notably, the budget includes funding to further implement DMV’s technology modernization project related to its driver license and vehicle registration programs ($33 million). Motor Vehicle Account (MVA). About $2.3 billion of the total funding for these departments will come from the MVA. To maintain the solvency of the MVA, the budget increases vehicle registration fees and penalties. Specifically, effective December 1, 2008, it increases base vehicle registration fees by $11 from $44 to $55, and doubles the penalty for late payment of registration fees for estimated new revenues of $278 million in 2008–09, and $491 million annually thereafter. The budget requires the DOF to reduce General Fund appropriations by $50 million, with a focus on scoring these savings from vacant employee positions in departments. In addition to these reductions mandated by the Legislature, the Governor has announced that the administration expects to be able to achieve $340 million in General Fund savings in 2008–09 due to leaving in place through the end of the fiscal year a July 2008 executive order that limited some departments’ overtime usage, contract spending, and use of certain part–time and temporary employees, including retired annuitants. Based upon departmental implementation to date, however, it is unclear whether the executive order will generate this level of savings. As described in the nearby box, if the budget reform measure passed by the Legislature is approved by the state’s voters, the Governor would have additional authority to make midyear reductions. The budget package includes measures to place two ballot measures before the state’s voters—pertaining to the lottery and budget reforms. It is expected that a special election will occur in the first one–half of 2009 to consider these measures, which could have major implications for the state’s upcoming budgets. The budget package includes three pieces of legislation related to the California Lottery (a constitutional amendment, a lottery securitization bill, and a lottery modernization bill) that require voter approval in order to take effect. Lottery Funds May Be Major Part of Future Years’ Spending Plans. The state’s budgetary plans for 2009–10 and 2010–11, as described by legislative leaders and administration officials, rely heavily on voter approval of the lottery package. In general, the lottery package would give the California State Lottery Commission more flexibility to increase the lottery’s prize payouts. This is expected to increase sales and profits for the lottery. These profits in turn would be available to benefit the General Fund—specifically, to retire various types of General Fund obligations, such as debt service. To offset the loss of these lottery profits to educational entities (which receive the profits under existing law), the measure increases General Fund appropriations to schools, community colleges, and the university systems by an amount likely to exceed $1 billion per year beginning in 2009–10. The securitization measure would allow the state to enter into a financial transaction to receive billions of dollars of the lottery profits now instead of over time. In so doing, these securitization revenues would be available to balance the 2009–10 and 2010–11 budgets. Lawmakers and the Governor have indicated that they plan to receive roughly $5 billion of securitization proceeds to help balance the budget in 2009–10 and another $5 billion in 2010–11. The budget package includes two measures that would make changes to the Budget Stabilization Account (BSA), created by Proposition 58 in 2004. Under current law, an annual transfer equal to 3 percent of General Fund revenues is made into the BSA. One–half of the transfer is saved as a reserve and the other one–half is used to make a supplemental payment to pay off outstanding deficit–financing bonds. The Governor can suspend the annual transfer in any year by issuing an executive order (as was the case this year). The budget reform proposition would increase funds in the BSA in a number of ways. First, the ability to suspend the annual transfer would be limited to those years in which prior–year General Fund spending (grown for inflation and population) exceeded estimated General Fund revenues. Second, unanticipated revenues exceeding the enacted budget’s estimate by more than 5 percent would be automatically transferred to the BSA. Third, the target cap on BSA funds would be raised from 5 percent to 12.5 percent of annual revenues. Finally, funds could be transferred out of the BSA only to (1) meet emergency costs or (2) to increase General Fund revenues up to the level of prior–year General Fund spending (grown for inflation and population). In addition, if the proposition were approved, the Governor would gain new authority to reduce General Fund appropriations during a fiscal year. Specifically, the Governor could reduce state operations or capital outlay appropriations by up to 7 percent. The Governor would also be given the authority to suspend the implementation of cost–of–living adjustments in specified circumstances. The state borrows billions of dollars for cash flow purposes almost every year—some internally (from special funds) and some externally (through the issuance of revenue anticipation notes or other securities to bond investors). These loans—generally paid off by the end of each fiscal year—allow the General Fund to meet its payment obligations throughout the year, since a large portion of its cash receipts is received in April and later. To reduce the state’s external cash flow borrowing need in 2008–09 and avoid higher costs for these loans, the Legislature approved various changes to General Fund payment schedules for school districts, community colleges, UC, and other programs in 2008–09. One key change affecting school districts was made during the special session, and several additional changes were made as part of the final budget package. Special Session Actions Related to Cash Management. In the special session, the Legislature passed Chapter 2, Statutes of 2008 (ABX3 4, Committee on Budget) which shifted—on a one–time basis—the bulk of the July payment for school districts to September. The shift resulted in the postponement of roughly $1.3 billion in K–12 payments. (Rather than disbursing 6 percent of total K–12 apportionments in July, the state disbursed only 0.9 percent, adding the 5.1 percent difference onto the September apportionment.) No change was made to community college apportionments. The K–12 action, combined with a few other payment deferrals adopted in the special session, helped the state’s cash flow situation in July and August. Final Budget Package Includes Additional Cash Management Measures—Mostly Affecting Education. The final budget package includes about $3.6 billion of additional payment delays to reduce the state’s cash flow borrowing need—with the most significant elements affecting school districts and community colleges. Specifically, the budget shifts $2.8 billion in K–12 funding from February to April (including one–half of the February apportionment for school districts as well as roughly one–half of the February payment for the K–3 class size reduction program). For community colleges, $245 million in monthly apportionments are shifted from the third quarter of the fiscal year to the last quarter. These changes were made on a one–time basis only. Additional, smaller changes in payment schedules that affected the UC and other entities were approved on a permanent basis. Package Also Includes Additional Interfund Borrowing. In addition to the cash flow deferrals described above, the final budget package includes statutory changes that make available hundreds of millions of dollars from special funds for interfund borrowing by the General Fund. These funds previously were unable to be borrowed by the General Fund for cash flow purposes. Therefore, these changes will further reduce the state’s external cash flow borrowing need in 2008–09 and thereafter. Work Group to Study Cash Flow Issues, Make Recommendations. To help address potential cash flow issues in the future, the Supplemental Report of the 2008–09 Budget Act called for the creation of a cash management work group. The group is tasked with examining how well cash disbursements are aligned with cash needs of school districts, child care providers, and community colleges. The work group is to identify any existing areas of misalignment and submit recommendations for better timing cash disbursements with costs incurred. The work group is to provide these recommendations to the administration and the Legislature by December 1. Very Limited Amounts for Employee Pay Increases. The budget act assumes that total pay and benefits for about 350,000 state government and university employees equal about $30 billion (all funds) in 2008–09. The budget, however, includes a very limited amount—$327 million ($124 million General Fund)—for pay and benefit cost increases, as shown in Figure 22. This is because the budget package assumes that the vast majority of state employees receive no pay increase in 2008–09. Almost All State Employee Contracts Have Expired. Almost all of the state’s memoranda of understanding (MOUs) with rank–and–file state employee bargaining units have expired, and this is the major reason for the small budget for compensation increases. As of July 1, 2008, MOUs with 19 of the state‘s 21 rank–and–file employee bargaining units (excluding only the units representing CHP officers and professional engineers) had expired. The professional engineers’ MOU expired on July 2 (following the effective date of the final pay increase under that agreement). The budget generally includes no funds for pay increases for the 19 other bargaining units, with the exception of pay increases resulting from orders of the prison medical care Receiver. (Judges are not a part of any bargaining unit and receive a pay increase each year pursuant to statute.) Consistent with its good faith negotiating requirements under state law, the administration continues to negotiate with various rank–and–file employee bargaining units and may present pay increase proposals to the Legislature at a later date. Legislature Rejects Funding Correctional Officer Pay and Benefit Increases. In September 2007, the administration declared that an impasse in negotiations with the California Correctional Peace Officers Association had led it to implement its “last, best, and final offer” with the correctional officers’ bargaining unit. (We described this offer in our February 2008 report, Correctional Officer Pay, Benefits, and Labor Relations.) In January 2008, the Governor proposed that the Legislature appropriate about $260 million in 2007–08 and $260 million in 2008–09 to implement the pay and benefit increase components of the last, best, and final offer. (The offer also included other elements, such as changes in work rules, that were not directly related to increases in pay and benefits.) Under state law, no part of the offer requiring the expenditure of funds or changes in state law may be implemented without legislative approval. In the budget act, the Legislature took action to reject the financial components of the last, best, and final offer to the correctional officers’ bargaining unit. Specifically, the budget act forbids the administration from using any funds in any item of the budget for the compensation proposals in its last, best, and final offer. Retirement Costs Assumed to Hold Steady in 2008–09. The budget act assumes that the state’s payment obligations for pension, retiree health, and other retirement programs will total about $6 billion ($4.6 billion General Fund) in 2008–09. This is about the same as the state spent on such obligations in 2007–08. Some retirement costs will increase this year but are offset by reduced spending (compared to 2007–08) due to a one–time $500 million payment to the California State Teachers’ Retirement System (CalSTRS) required under a court order last year. CalSTRS Purchasing Power Benefits. The budget package enacts changes to a category of CalSTRS benefits—principally received by retired teachers age 80 and over—that protect the purchasing power of retirees’ pensions from being eroded by inflation. Based on recent actuarial findings concerning the availability of funds in CalSTRS’ Supplemental Benefit Maintenance Account, these changes are expected to result in an increase in the purchasing power benefits. In exchange for allowing this and other changes, the state’s contributions for the benefits will decline by at least $66 million each year beginning in 2008–09. The recent court order described above also ordered the state to pay interest on the $500 million the state withheld from the system on a one–time basis in 2003. A budget trailer bill appropriates these funds—$57 million each year for four consecutive years—beginning in 2009–10. Rural Health Program for State Retirees Eliminated. The budget package eliminates a program that provided additional health benefit subsidies for state retirees living in rural areas not served by a health maintenance organization. This change results in over $5 million of ongoing, annual General Fund savings. This change will increase the out–of–pocket health care expenditures of several thousand rural retirees and their family members by a like amount. Unlike most other retirement programs, the rural health care program involved statutory language that explicitly authorized the Legislature to change or terminate the program. A similar program for active state employees was not affected by this action. Retiree Health Liabilities. Currently, California public employee pension and retiree health programs have unfunded liabilities of about $109 billion. Of this amount, the largest portion—over $59 billion—relates to the unfunded retiree health liabilities of the state and the two university systems. Like most governments in the United States, the state has long paid its retiree health obligations on a “pay–as–you–go” basis, which essentially defers payment of retiree benefits earned by current employees to future taxpayers. (By contrast, pension obligations are largely funded on an annual basis, and these funds are set aside and invested to generate returns that minimize costs for future taxpayers.) In January 2008, a commission appointed by legislative leaders and the Governor recommended that the Legislature begin funding retiree health benefits in the same manner as pensions and amortize existing unfunded liabilities over the next few decades. The 2008–09 budget package contains no funds for this purpose. Nevertheless, it is possible that an updated actuarial valuation this fall will show that the state’s unfunded retiree health liabilities have declined. This is because the California Public Employees’ Retirement System has negotiated state health plan premium increases in 2008 and 2009 that are well below those assumed by actuaries last year when they completed the state’s previous retiree health valuation. Despite these relatively low premium increases (compared to recent years), costs for state and CSU retiree health benefits are projected to increase by 7.6 percent in 2008–09 to $1.2 billion—well above the rate of expenditure growth for the overall state budget. The state administers two property tax assistance programs which provide cash grants for eligible senior citizens over the age of 62, the blind, and the disabled. Grants are provided to applicants with incomes of less than $44,000 on a sliding scale—with the lowest income applicants receiving the most assistance. One program provides grants to homeowners in order to offset a portion of their property tax bill. The homeowners’ program serves about 140,000 participants, providing up to $473 annually. The second program provides grants to renters in order to offset a portion of the property taxes that are passed on to them in the form of increased rent. The renters’ program serves about 460,000 participants, providing up to $348 annually. In January, the Governor proposed reducing each grant by 10 percent. Then, as part of his August Compromise, he proposed suspending all grants for homeowners as well as reducing renters’ grants by 10 percent. The enacted budget fully funded the two programs—$41 million for the homeowners program and $150 million for the renters program. The Governor, however, vetoed the entire $191 million in appropriations, leaving the programs with no funding for 2008–09. Budget legislation authorizes the development of FI$Cal, a single, integrated, statewide financial management system that would replace the state’s aging legacy budget, accounting, and procurement systems. The FI$Cal system is expected to cost an estimated $1.6 billion and take 12 years to fully develop. Under the legislation, the DOF, the State Controller’s Office, the State Treasurer’s Office, and the Department of General Services must collaboratively develop, implement, and maintain FI$Cal. The FI$Cal system will be developed and rolled out to all state departments and agencies in two main phases. Phase One will include the departments listed above as well as DSS, the Board of Equalization, DOJ, and the Department of Parks and Recreation. The administration may not proceed beyond Phase One without legislative approval after the Legislature has received a report on Phase One implementation. For 2008–09, the budget authorizes about $40 million for support of FI$Cal. About $38 million will come from the FI$Cal Internal Service Fund (funded through a General Fund loan) and about $2.2 million from a General Fund appropriation. Budget legislation also authorizes the State Public Works Board to issue debt in the form of bonds (up to $277 million initially, with more possible upon further legislative approval) to finance the costs of FI$Cal. These bonds would pay back the $38 million from the FI$Cal Internal Service Fund and provide funding for the next few years of development. Budget legislation also states the Legislature’s intent that, to the extent possible, the cost of FI$Cal be paid for by appropriations from the General Fund, federal funds, and special funds rather than bond financing. The 2008–09 budget provides $1 billion ($10 million General Fund) to support state housing assistance programs administered by the Department of Housing and Community Development. Of this amount, $741 million is from Proposition 1C bond funds, which is a reduction of $382 million compared to the 2007–08 level of bond funding. This reduction reflects the elimination from the 2008–09 spending plan of one–time allocations in 2007–08 to meet the high demand for new Proposition 1C programs. The budget includes $200 million for Infill Incentive Grants, $194 million for affordable rental housing programs, $188 million for affordable homeownership programs, and $95 million for the Transit–Oriented Development program. Citing the state’s fiscal condition, the Governor vetoed about $5 million the Legislature had provided from the General Fund for other housing programs. The vetoes eliminated the state’s share of funding for the Employee Housing Assistance program, which oversees private employee housing facilities, and the Emergency Shelter program, which provides funds to nonprofit and local government agencies to support approximately 19,000 homeless shelter beds. Redevelopment Agency Payments. Budget legislation requires redevelopment agencies to make a one–time deposit, totaling $350 million, into the Educational Revenue Augmentation Fund (ERAF). These funds, in turn, are allocated to K–12 districts and decrease state General Fund spending for education by a commensurate amount. The amount of each agency’s required ERAF deposit (roughly 7 percent of its property taxes) reflects its proportionate share of statewide redevelopment property tax revenues. Budget legislation also requires redevelopment agencies to pay certain outstanding pass–through amounts owed to local governments, including K–14 districts, for 2003–04 through 2007–08. Noneducation Mandates. Legislation enacted during the third special session (Chapter 6, Statutes of 2008 [ABX3 8, Committee on Budget]) modified the state’s mandate payment schedule so that the state reimburses local governments two fiscal years after they implement mandates. This schedule change deferred most state mandate payments from 2008–09 to 2009–10. (The $11 million of mandate funding in the 2008–09 Budget Act reimburses local governments for a small number of mandate bills outstanding from 2005–06 and 2006–07.) The budget act does not include funding to make a payment ($75 million) towards the state’s 15–year plan to retire the state’s pre–2004 mandate debt.